1. Nozomi Project Bilingual Staff The Nozomi Project is looking for an individual (21 years of age or older) with the passions, calling, and abilities to work in a growing social enterprise at our Ishinomaki headquarters. Passion to work with women in a Christian business environment. Some degree of both English and Japanese language ability. Computer abilities (Word, Excel, ability to learn inventory database, etc.). Willingness to raise partial support. Length of Term: minimum one year (starting at earliest January 2016). Participation in the day-to-day business life of the Nozomi Project. Working with staff on marketing, sales, website, inventory, supplies, etc. Financial Terms: Partial compensation; partial support-raising. 2. Children’s Educator Our Be One team* in Ishinomaki, Tohoku, is looking for an experienced educator to teach our home-schooled missionary children. This would include responsibilities for teaching 4-5 children in different stages of learning, between sixth grade and high school. In particular, as our junior-high aged children transition from Japanese schooling to an all-English curriculum, we seek an experienced teacher who is able to flex with different curriculum and learning styles.Position available: Starting (as early as) March 2016.Length of Term: Minimum one-year commitment.Financial Terms: We are praying for an educator to join our missionary team who will raise support and is called by God to work with us as a full-time teacher. 20 years of age and completed at least one year of college. Willingness to raise necessary support. Be a servant learner, willing to serve and learn from the local church and community. Participating in the day-to-day business life of the Nozomi Project. Assisting with Nozomi Project English correspondence, orders and computer inputting. Inquiry Process: Please email us for more information. 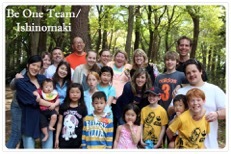 *More about our Be One/Tohoku team: We are a house-church network that began in the greater Osaka area about fourteen years ago. Through God’s calling and guidance, Be One/Tohoku consists of several families (JEMA members) and several singles who have intentionally relocated to Ishinomaki following the 2011 tsunami. Our vision is to see disciples and communities of believers spread throughout Tohoku, and to see leaders emerge from the new harvest who will begin reproducing disciples. We are also committed to helping meet the practical needs of those in our community. Two of our current means of outreach are the Nozomi Project (a social enterprise making jewelry), and a sports center that serves as a gathering place for youth in this community.